Next Vision Review 2019: Is Next Vision a Good Hosting? Next Vision is, without a doubt, a top hosting provider both in terms of pricing as well as rich features and ease of use. 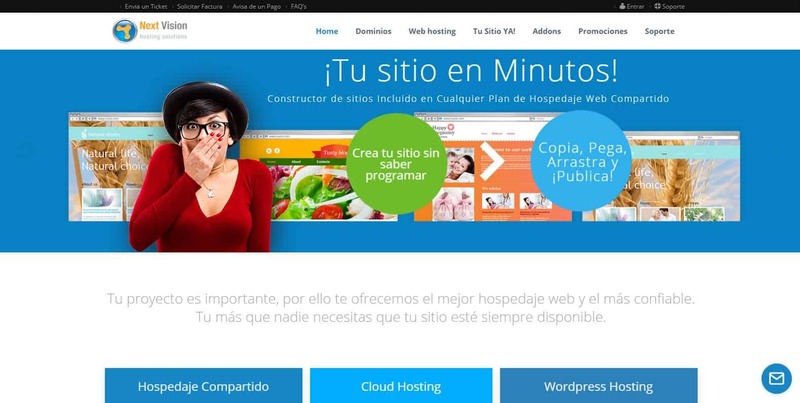 Mexico based Next Vision is an attractive website hosting option thanks to its unlimited packages and budget hosting. For a company that promises such good service, it is surprising to see that they do not have any info on the website about their own history. That shouldn’t bother you, though, as there are some great packages in store for you at Next Vision. Judging from their social media accounts, one can assume they’ve been in business since 2011. If you’re a website owner with little technical know-how, Next Vision has plenty to offer. First up is the website builder. The website builder contains numerous handy features and even the ability to create online stores. The way it’s listed on their website, it’s safe to assume the website builder is free of cost. If that is indeed the case, it makes the hosting package much more valuable. In addition to the site builder, there is the Softaculous application installer that should make your life much easier if you use applications or scripts on your website. There are more than 100 applications available with all of the important blogging and e-commerce ones included. They allow you to register new domains and will transfer your existing domains free of charge. Keep in mind, however, that their servers work on Linux and therefore they only offer support for PHP and not for ASP pages. Other languages that they support include HTML, Java, Perl, XML. Flash, Python, and a few more. Like any other serious hosting provider, they also offer 99.9% uptime, technical support, and a 30-day money-back guarantee. Since their packages are so well priced and are rich in features, it is definitely worth checking them out. The four packages on offer are Basic, Pro, SMEs, and NV. They don’t offer unlimited storage or bandwidth, but considering their price, it is worth contemplating if the available storage and bandwidth will be enough for you. It should be enough in most cases, and if so, the price is definitely attractive. For multiple website owners, even the Pro package offers ten domains. In fact, even the most expensive package, NV, is quite affordable if you compare the price to the competition. All packages offer unlimited emails, subdomains, databases, and FTP accounts. Scaling is easy and as soon as your requirements increase, you can call them and get your plan upgraded. Next Vision Hosting claims a 24/7 support system, but that probably doesn’t apply to their live chat which was offline when I tried to check them out. It is, therefore, safe to assume that the 24/7 technical support refers to the ticketing support system. They also actively manage their social media accounts which can be a good alternative for contacting them. Next Vision’s plans are perfect for owners of multiple websites looking to find a hosting provider with unlimited features on a budget. No Windows-based hosting is probably a disadvantage here, but if you’re comfortable with Linux based hosting account, there is much value to be had at Next Vision! Wondering how Next Vision stacks up against other Web Hosting companies? Enter any other Web Hosting company and we will give you a side-by-side comparison.